review by VJ Miller, Sr. 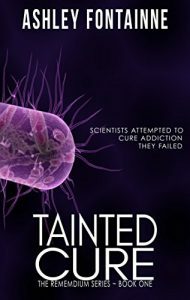 Tainted Cure by Ashley Fontainne is like any book you might select and should not be judged by its cover. Simply reading just the title could be easily misunderstood. What kind of cure should we expect? One for cancer, or heart disease or possibly mental illness; maybe even one of the most virulent sexual diseases. A closer inspection of the subtitle tells us exactly what to expect from the pages inside. Scientists Attempted to Cure Addiction – They Failed. Those words never conveyed the pages of unrelenting action that lay between the covers.